Wondering if your battle with weight is deeper than just diet and exercise? Break through the mental barriers that keep you struggling so that you can confidently lose weight and keep it off permanently. Why does long-term weight loss seem so impossible to achieve? 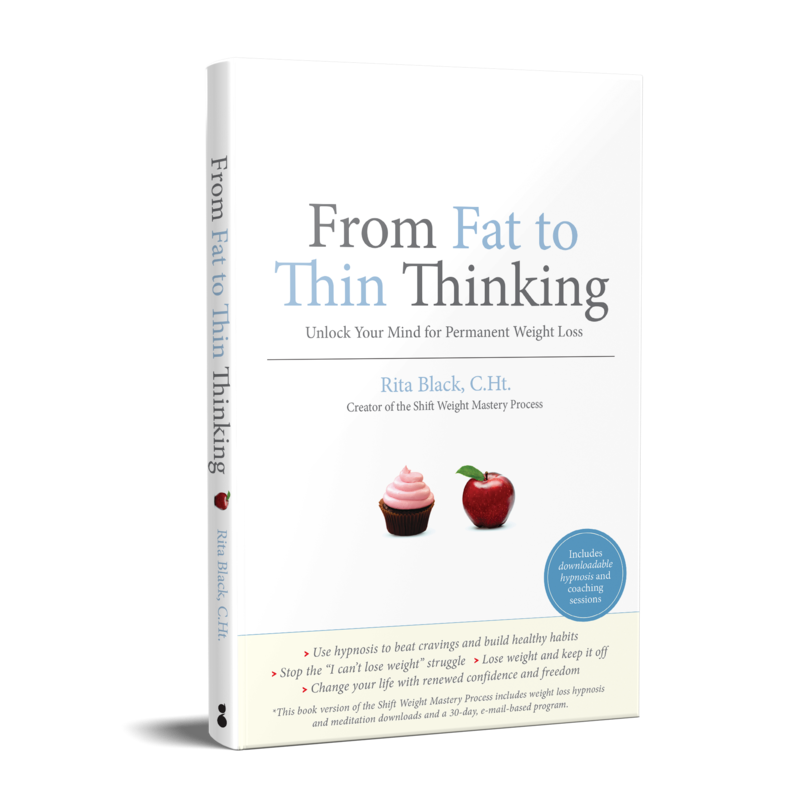 In From Fat to Thin Thinking, renowned clinical hypnotherapist and former weight struggler, Rita Black takes you on a powerful journey to truly change your life. She shows how the weight struggle is not your fault, rather that our subconscious brains are wired to keep us in the unending struggle with weight. With equal parts empathy, humor and a compelling blend of science, story-telling and powerful mental techniques, From Fat to Thin Thinking gives you the keys to free yourself from the prison of your struggle with weight and the ability to begin living the slimmer, more confident life you have been waiting for. 30 days of coaching emails from Rita Black which take you step-by-step through your first 30 days. Exclusive hypnosis and meditation audio sessions that go deep into your subconscious to effect change in your brain. Worksheets and cognitive coaching exercises. This breakthrough book is based on Rita Black’s exclusive hypnosis-based Shift Weight Mastery Process Seminar and 30-Day Process that has, up until now, only been available in Los Angeles a few times a year. This process has created graduates that claim over 10 years of sustained weight losses. Now it is available to you in From Fat to Thin Thinking. 2) Listen to the hypnosis sessions that help you to melt the mental barriers to long-term weight loss. Change the negative beliefs and habits that are keeping you stuck in a weight struggle and develop a new and healthy relationship with food, exercise and yourself. Stop the “on a diet”/ “off a diet” yo-yo cycle and take back control over your eating. Achieve your ideal weight and knew you are going to keep it off! If you are ready to end the weight struggle that has been holding you back from your best life, this is the resource you’ve been waiting for. Rita Black, C.Ht., is a certified clinical hypnotherapist specializing in long-term weight loss and smoking cessation. She is the director of Shift Hypnosis and Motivational Resources and has led the highly successful Shift Weight Mastery Process seminars for over a decade. She is the creator of Shift In a Box and Shift Monthly Mastery.